For cost-effective drainage in Margate, Precast Concrete Scuppers can be installed flawlessly in your parapet walls, preventing ponding water on your roof or deck. These scuppers are designed to allow rainwater to exit through outlets instead of ponding and causing rotting wood, mold, and structural damage in your residential, commercial, or industrial building. Since 1965, Atlantic Coast Precast has worked closely with many industry professionals. We can offer decades of experience when it comes to casting personalized scuppers in Margate from Precast Concrete. 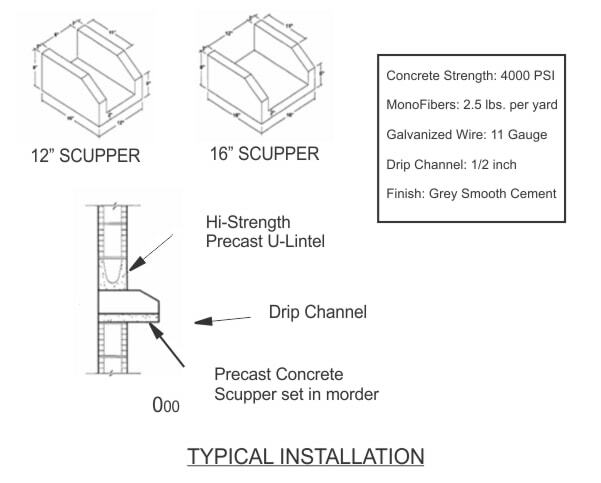 Scuppers can be both decorative and functional when you choose Atlantic Coast Precast. You'll be able to choose between a variety of sizes from 8 inches to 18 feet, with custom designs made to your unique specifications. Since precast can be easily customized and is watertight, it's ideal for roof and deck water management. Leaves and debris can be easily flushed through each outlet when you choose Margate precast concrete scuppers, preventing your drains from becoming blocked. Improper placement or positioning for your scuppers can lead to structural damage, too, so make sure you hire a team you can trust to ensure a tight, flawless installation with a weather-resistant seal. Learn more when you call for a FREE quote. Our team is proud to work with many types of clients.